Every month we take a closer look and brake down the sales data of downtown condos from the previous month. Here are the statistics for March 2019 and the top five "downtown" area's - Centretown, Byward Market and Sandyhill, Little Italy (which includes Lebreton Flats), Hintonburg, and Westboro. The information will be specific to apartment style condominiums, and only what sold through the MLS. Also, DOM (Day's On Market) is calculated to include the conditional period, which in Ottawa is almost every single transaction to be roughly 10-14 days. Do you have any questions about how this information affects your investment or looking for more information to make the best decision about your purchase? Let’s chat! Fill out the form on the bottom of the page. As we do every month, we have taken a closer look and broken down the sales data for the month of February 2019 for the top five "downtown" area's - Centretown, Byward Market and Sandyhill, Little Italy (which includes Lebreton Flats), Hintonburg, and Westboro. The information will be specific to apartment style condominiums, and only what sold through the MLS. Also, DOM (Day's On Market) is calculated to include the conditional period, which in Ottawa is almost every single transaction to be roughly 10-14 days. Do you have any questions about how this information affects your investment or looking for more information to make the best decision? Let’s chat! Fill out the form on the bottom of the page. As we do every month, we have taken a closer look and broken down the sales data for the month of December 2018 for the top five "downtown" area's - Centretown, Byward Market and Sandyhill, Little Italy (which includes Lebreton Flats), Hintonburg, and Westboro. The information will be specific to apartment style condominiums, and only what sold through the MLS. Also, DOM (Day's On Market) is calculated to include the conditional period, which in Ottawa is almost every single transaction to be roughly 10-14 days. Questions about how these numbers affect your investment/condo? Let’s chat! Fill out the form on the bottom of the page. Sales continue to keep 1451 Wellington moving along. Roughly 70% of the 93 suites are sold, with available units remaining on lower floors and a few penthouses. Starting at $489,990 for the 578sqft one bedroom unit, and up to $2,979,990. 1451 Wellington currently has one of the highest average price per sqft for pre-construction condos in Ottawa - almost $850sqft! The presentation centre is set to close in February 2019 with construction starting shortly after. Occupancy is slated for June 2021. Monocle Westboro, built by Ashcroft Homes, was launched earlier this year and will be located at 91 Shannon Street near the corner of Richmond and Island Park. Monocle is comprised of 62 suites and penthouses, over four floors. As of today, the project is 35% sold, with a decent supply of different sizes and price points. Pricing for available units starting at $686,990. Construction is set to begin this spring with occupancy expected for spring 2021. As we do every month, we have taken a closer look and broken down the sales data for the month of November 2018 for the top five "downtown" area's - Centretown, Byward Market and Sandyhill, Little Italy (which includes Lebreton Flats), Hintonburg, and Westboro. The information will be specific to apartment style condominiums, and only what sold through the MLS. Also, DOM (Day's On Market) is calculated to include the conditional period which in Ottawa is almost every single transaction to be roughly 10-14 days. Questions about how these numbers affect your investment/condo? Contact us to chat more! Each month we take a closer look at the previous monthly condo sales data for the top five "downtown" Ottawa area's - Centretown, Byward Market and Sandyhill, Little Italy (which includes Lebretown Flats), Hintonburg, and Westboro. The information will be specific to apartment style condominiums, and only what sold through the MLS. Also, DOM (Day's On Market) is calculated to include the conditional period which in Ottawa is almost every single transaction to be roughly 10-14 days. Questions? Questions? Want to know how it affects your condo? Fill out the form below and let’s chat. Every month we take a closer look at the sales data for the previous month for the top five "downtown" area's - Centretown, Byward Market and Sandyhill, Little Italy (which includes Lebretown Flats), Hintonburg, and Westboro. The information will be specific to apartment style condominiums, and only what sold through the MLS. Also, DOM (Day's On Market) is calculated to include the conditional period which in Ottawa is almost every single transaction to be roughly 10-14 days. Questions? Huge jump in the average selling price for Centretown condos this year compared to September of 2017. Part of the reason for the large jump was due to a number of sales over the $500k mark. Over last month, we saw a similar number of new listings, while we saw quite a few more properties sell (33 vs 24). The list to sold price ratio stayed about the same, with the days on market increasing slightly (63 vs 51). Compared to last month, the Byward Market saw a healthy jump in average sold price with the number of sold condo units fell over last month (16 vs 24). Other than the differences in sold price, September of 2018 is pretty much the same as last year. Little Italy continues to see fewer sales compared to new listings which is great if you are a buyer looking to enter. The average selling price is up over last month (362,330) and last year (329,086). Take the sold data with a grain of salt, since there is only a few sales to provide an average. Hintonburg continues to be an area with healthy demand and very few options for buyers. Lots of older product with very few modern buildings that continue to cause havoc on the numbers. Like last month, we saw the same amount of new listings that ended up selling, providing no increase or decrease to number of available product. With that, the DOM and list to sold price continue to weaken. We are seeing first hand that nice product that is priced right will sell quick! 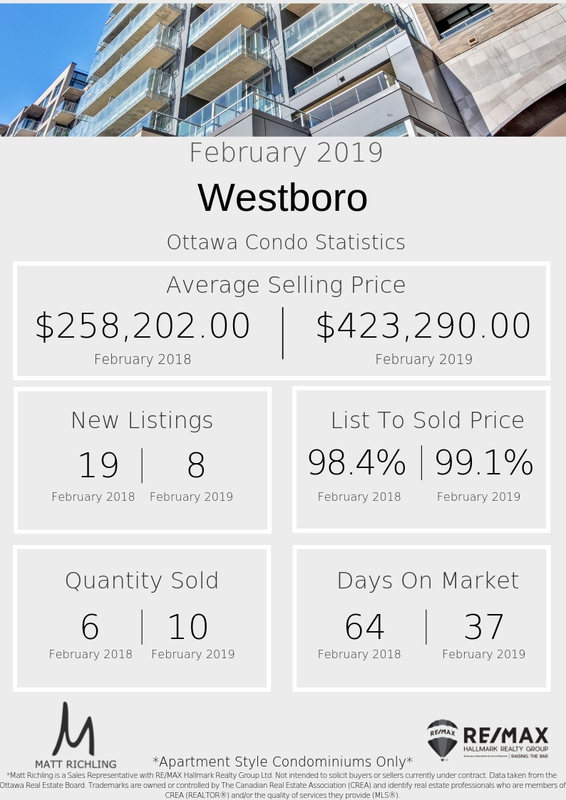 Westboro continues to stay in great shape with one of the highest average selling prices. The DOM tightened up over last month, however we saw more activity which brought the other numbers more in line with what we are seeing across the city. Looking for specific information about an Ottawa condo building or area? Thinking of buying and maximizing your dollar? Let's chat. Fill out the form below. We have taken a closer look at the sales data for the month of August 2018 for the top five "downtown" area's - Centretown, Byward Market and Sandyhill, Little Italy (which includes Lebretown Flats), Hintonburg, and Westboro. The information will be specific to apartment style condominiums, and only what sold through the MLS. Also, DOM (Day's On Market) is calculated to include the conditional period which in Ottawa is almost every single transaction to be roughly 10-14 days. The market in Centretown slowed down over the month of August as most buyers and sellers are typically traveling or enjoying the summer before heading back to work. Compared to last month, (July 2018 stats) we saw our average selling price drop from $371,512 to $358,201, and only 32 new listings to July's 48. List to Sold prices came back to along what it was last year. What does this mean? While you could argue things slowed down, the lack of demand (fewer buyers) showed its head, and unless we see an increase in new listings in September, the DOM and list to sale price ratio will tighten up as there will be less to buy. We saw a more balanced market in August. Compared to July, we saw a $90,000 reduction in average sale price, fewer days on market, and a tighter list to sold price. In August we saw an equal amount of new listings to sold listings. What does this mean? There was a higher demand for lower priced properties, and a strong pull from investors looking in that sub 300k market. The low amount of new listings, shorter days on market, and higher list to sold price ratio means things can easily jump in September unless we see more product come on the market. A sellers market below $300k, and a buyers market above $300k. The seven sales in July were hot, which is evident in the 99.7% average list to sold price and the 35 average days on market. The average selling price dropped, which needs to be taken with a grain of salt since we have such low number of data points. What does this mean? The properties that sold, were priced well and hot for the buyers looking. Its a buyers market, unless you are looking at one of the hot listings. Last month saw 14 new listings with only 4 sold. Looking at the differences over last year might give you a scare - however with such few data points, you need to understand it is not a perfect example and rather use trends to better understand the market. We saw more new listings and more sales this month than last month. The days on market stayed the same, and the average selling price dropped. Other than price, things have certainly improved over last year! What does this mean? As with other areas, the amount of sales below the 300k continue to dominate. The market has certainly improved over last year, and I would be willing to bet that next month you will see the selling price jump back up. The lower DOM over last year still signifies that more buyers are looking here than before, and would be a good time to sell! Like last month, Westboro continues to be one of the hot markets with high prices and low inventory. A very tight List to Sold Price ratio and such few new listings makes this a unique market when you see the high DOM. The right properties are selling for close to ask, but taking longer. I would be willing to bet that September will see DOM drop. Looking for specific information about a building or area? Thinking of buying and maximizing your dollar? Let's chat. Fill out the form below. Let's break down some specific data for the month of July for the top five "downtown" area's - specifically Centretown (including Golden Triangle), Byward Market and Sandyhill, Little Italy (which would include Lebreton Flats), Hintonburg, and Westboro. The information will be specific to apartment style condominiums, and only what sold through the MLS. Also, DOM (Day's On Market) is calculated to include the conditional period which in Ottawa is almost every single transaction to be roughly 10-14 days. The market in Centretown continued to tighten for July which is noticeable in the higher list to sold price ratio of 99.1% compared to 98.8% (from last month) and the fewer days on market of 43 compared to 46 (from last month). We still have a similar amount of new listings as last month, however the amount of units that sold have dropped from 43 (June) to 29 (July). Prices are up compared to last year, however holding about the same as last month. What does this mean? While things have tightened up, the numbers would show that there is going to be more units available going into August. This might ease up the DOM, Sold Price Ratio, or the average sold price - more supply with equal or less demand.... Could be seeing a shift to a more buyer focused market. Compared to last month we have seen similar numbers except for two. The average price has jumped from $362,773 in June 2018, to $410,517 for July 2018. Keep in mind that in May 2018 it was almost $400k, so the large change is expected and due to the few number of data points that are used can vary the number. At the same time, the days on market has increased from 50 last month, to 84 this month. Note - the DOM hit 162 days back in January of 2016. What does this mean? With the DOM jumping up to 84 days, yet amount of new and sold listings staying almost the same as last month, we would expect the price to come back down or the list to sold price ratio to drop. Still continues to be more of a buyers market, especially with the higher DOM, lower LTS price ratio, etc. Average price has jumped over last month (June 2018) to $395,175. However that is based on the only four sales that happened this month. We continue to see more new listings, and fewer sales. DOM has increased to 50 days and the LTSP ratio has nudged up to almost 98.9%. What does this mean? A buyers market. Higher DOM, more options (listings), etc. With only four sold it means you have less competition. However the high LTSP ratio says that for the sellers who are serious, and priced right, you can and will sell. The average sold price has dropped to $318,173, when it was $374,620 last month (June 2018). Activity has dropped (both new and sold listings), and the LTSP ratio edged up slightly. What does this mean? More of a sellers market. With fewer units available overall, a higher sold price ratio, and a somewhat low DOM, It would be a good time to sell. Buyers will want to see more supply, or need to be quick on their feet for the best units. The average price is up over last month, but down over this time last year. Less activity then last month, but similar ratio of new vs sold units. Same LTSP ratio as last month with DOM increasing slightly. What does this mean? Sellers market. Highest average price, and highest LTSP ratio, along with the similar ratio of new vs sold listings, make it a very difficult buyers market. Not much negotiating is going on. Chances of multiple offers are strong. Again, the higher price point is due mainly to the larger, longer planned living (compared to the studio and sub 600sqft units in Centretown etc.). Looking for specific information about a building or area? Thinking of selling and want to get the best return? Let's chat. Fill out the form below. Often, real estate is defined by its numbers and data - we can report on "hard facts" to provide a picture of the market. However, when we receive the standard monthly updates from the Ottawa Real Estate Board, I find it quite frustrating that the data reported for "condominiums" is board wide - meaning any property type that was listed as a condominium in any area. (This isn't a rant - there are too many micro markets across the city for them to report). What this means is that the information isn't compared by location (downtown vs Kanata) or property type (example - apartment or townhome) which can often mask or hide very interesting or specific information on a more detailed level. We all (should) know that there is a huge difference in price between a townhouse style condo in Kanata, versus a modern downtown highrise apartment in Centretown. Let's break down some specific data for the top five "downtown" area's - specifically Centretown (including Golden Triangle), Byward Market and Sandyhill, Little Italy (which would include Lebreton Flats), Hintonburg, and Westboro. The information will be specific to apartment style condominiums, and only what sold through the MLS. Also, DOM (Day's On Market) is calculated to include the conditional period which in Ottawa is almost every single transaction to be roughly 10-14 days. (North of 417, Canal to the East, Bronson to the West, Parliament Hill to the North). Overall the average sold price for a Centretown condo over the last month is $371,998.00 which is up compared to a year ago, which saw an average list price of $347,394.00. The average DOM is at 46 which is an improvement over last year at 80 days (Keep in mind that includes the conditional period). The list to sale price ratio has increased to just under 99%, and a nice increase over last year at just above 97%. In June, we saw only 47 new listings, with 43 sales. What does it mean? A healthy increase in the demand for condos located in Centertown. A much more balanced market, with prices continuing to rise at a very marginal rate. One thing to note is that the DOM from two years ago was up to a whopping 85 days. Based on what was listed vs sold, I would expect the market to be more of a Seller's market unless we see more listings! The average sold price this month in the Byward Market and Sandy Hill has dropped slightly to $362,773. The DOM has dropped to 50 days, and much better than it was 3 years ago - 75 days. The list to sale price ratio held the same around the low 97%. What does this mean? Prices are lower and becoming more attractive to buyers which is helping to reduce the DOM. Slightly more leaning towards a buyers market then for selling. With the DOM lowering you should see the list to sale price ratio increase. The average sold price for a condo in Little Italy is down to $386,900. The average DOM is up to 47 days, with the one year at 45 days. The average list to sold price ratio is up to 98.1%. Overall there are less new listings with a few more sales compared to last year. What does this mean? Since there are fewer buildings which mean fewer sales, the numbers will be affected more by each sale. Lower prices will drive the DOM and sale price ratios as buyers compare them to other areas. The number of listings will increase, and as prices drop, the number of sales will increase. Great market if you are a buyer looking for options with less competition. The average sold price in Hintonburg lowered slightly from last year, to $374,620. More sales and a much tighter list to sold price ratio have dropped the DOM to less than half - now 39 days from the 89 days a year ago. What does this mean? It is much more of a seller's market than a buyer's market. I think it will get tighter unless we see more listings. More buyers looking to move more west! It is a great time to sell. The average sale price in Westboro is up from last year to $474,406. With 17 new listings and 17 sold properties. The highest list to sold price ratio in any of the five area's at 99.4%! The DOM is also quite low at 37! What does this mean? A hard market if you are a buyer. Considering that almost all condos will sell with a conditional period for status certificate review of 10-14 days, the DOM of 37 is very good for sellers. The higher price point is due mainly to larger, longer term planned living (compared to studio's and sub 600sqft units found more in Centretown and Byward Market). Are you looking for more information about a specific area or building? Thinking of selling or buying? Let's chat - click on the button below! 1451 Wellington - the residences at Island park drive, are off to a strong start with just under 50% sold. There are still options for all sizes and price points, with a few looking slim. The building is a Mizrahi development that is expected to be completed in 2021. It is a 12 story building featuring only 93 units. Prices start at $479,900 for a one bedroom, up to $1.325 million and up for two bedrooms plus den. Parking is $40,000, storage $10,000, with monthly maintenance fee at 85 cents a square foot. Click here to download a copy of the 1451 Wellington Sales Brochure. 1451 Wellington - the latest development from Mizrahi Developments in Ottawa, is set to have their grand opening launch this Thursday, May 11th, at 6pm. There is a fully furnished replica of the lobby and entertainment room, along with kitchen and bathroom vignettes. The 12 Storey building features pricing starting from the mid $400,000’s. Tamarack Home's newest building Tamarack Wellington, a 52 unit, six floor building, designed by Barry J. Hobin, will be starting construction this Monday, March 9th. Located at 1140 Wellington Street West, the building is set for completion mid 2016. Currently 37% sold out, with floor plans across every floor still available. After overcoming some final hurdles to obtain our Building Permit, we are now officially ready to start Construction! Taggart Construction has mobilized on site and are completing some exploratory work in preparation to commence shoring and excavation work next week. On Monday March 9th, our shoring contractor will begin to drill and install piles along the perimeter of the site. You will see a large drill rig on site that will be used to drill and drive the piles into the earth. As we install the piles, we will be removing earth and installing lagging to support the extent of the excavation. This portion of the work will take roughly 2-3 weeks to complete. What to expect during this stage of construction? -Increased site activity. You will see delivery trucks, equipment being delivered, and increased activity of individual workers on Site. Safety is our number one priority. We will ensure that every truck entering and leaving the site does so with traffic control present. -Noise caused by drilling and driving piles into the earth will be evident. This is typical construction practice and should not disrupt daily activity for nearby residents and businesses. Noise will only be heard during conventional hours of Construction (7am-5pm). -Removal of earth will be ongoing but infrequent. Due to the infrequency of loads traffic should not be impacted. -Removal of trees – We are required to remove four existing trees at the east end of our property, bordering the Grace Hospital. We will be replacing these trees with a mix of new species that will enhance the natural landscape of the area. -Installation of Site Servicing at the east end of our Site is schedule to commence on March 23rd. We will update the blog as dates become firm. -Line drilling and rock blasting is scheduled to commence on March 30th. We will be sharing a detailed blasting schedule and blasting protocol as we approach this stage of the work. Thank you all for your ongoing patience and support! This past saturday, I stopped by the public launch of UpperWest condos located at 485 Richmond Rd in Westboro. There were about 40 people floating around the sales center, some signing contracts, some musing around the model suite, with others in to see what all the fuss is about. With local radio station Hot89.9FM, Bridgehead Coffee providing music and coffee, there was no shortage of people. While my client didn’t move on a unit during our visit, he was impressed with the views from the higher floors, along with some of the floorplans. With 197 suites total, there won’t be a shortage of favourite units, appealing to all budgets. The smallest unit Fraser (455sqft) and the Wilmont (479sqft) both studios, starting at $210,900 which would be located in floors 1-5 (the podium). There are a number of 6th floor Terrace suits, but the best being the regular and penthouse suits due to the view. The smallest unit 7thfloor and up is the Ashton (532sqft) starting at 249,900 facing south, followed by the Wesley (547sqft) at 249,900 facing East. Obviously the best views being dead north, followed by east and west. One trend we are seeing are the balloon photos which help show views from each unit to help give prospective clients the edge when purchasing without being able to see the finihsed product. This is a must in a building like UpperWest which is surrounded by existing buildings. Parking is available starting at $33,000 for units more than 600sqft, and lockers from $3,500. The parking is all going to be above ground, which would save the developer HUGE costs since (from what we have previously been told) parking costs are usually about double what the developer charges, but must be included due to restrictions from the City of Ottawa. Condo fee, or the maintenance fee will be approximately $0.42 per sqft. Deposit was another HUGE drawback, Minto is asking for 25% staggered throughout the process. Expect UpperWest Condos to be completed sometime summer 2015. For more information or pricelist, visit the sales website HERE or contact me directly atMatt@MattRichling.com.